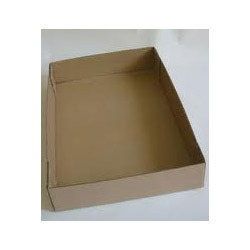 Our product range includes a wide range of Telescopic / Slotted Tray and Wax Coated Box. We are engaged in offering our customers fine quality Telescopic Tray which is a shallow platform designed for carrying things. Our range of Telescopic Tray is larger than a salver, a diminutive version commonly used for lighter and smaller servings, etc. Clients can avail from us this range of Serving Tray at most affordable prices.